The REI have launched a new Eye Movement clinic, with an open event in the Post Graduate Medical Centre at Derriford Hospital. The event opened doors to both medical colleagues and members of the public to raise awareness of the new clinic, which allows for diagnostic testing and clinical assessment in the same session. Attendees were given demonstrations of the new diagnostic devices, including the new EyeLink1000 plus Eye Tracker, which was funded by infantile nystagmus charity, IN-vision. The EyeLink1000 plus allows for more precise detection of small changes in eye movement and minimises the amount of time the infant needs to remain stationary. 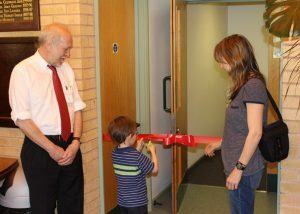 Professor Chris Harris (Professor of Neuroscience at the University of Plymouth) and members of the clinical team gave a series of talks on eye movement disorders and Liz Charter from IN-vision was in attendance with her son, Mikey who performed the ribbon-cutting duties. For more information about the new service offer at the REI, please contact the Orthoptic Department on 01752 439309 or email julie.owen4@nhs.net.